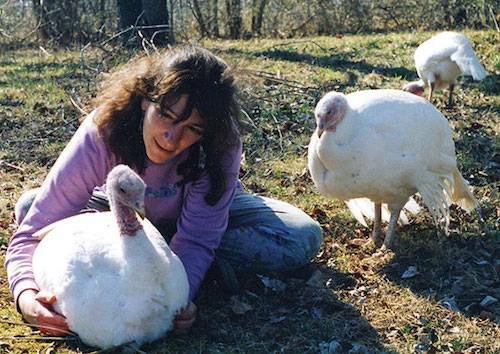 Turkeys - Who Are They and How Can We Help Them? Turkeys have a zest for living and enjoying the day. Treated with respect, they become very friendly. At a distance, turkeys look like otherworldly visitors moving gracefully through the grass. Up close one sees their large, dark almond-shaped eyes and sensitive fine-boned faces. 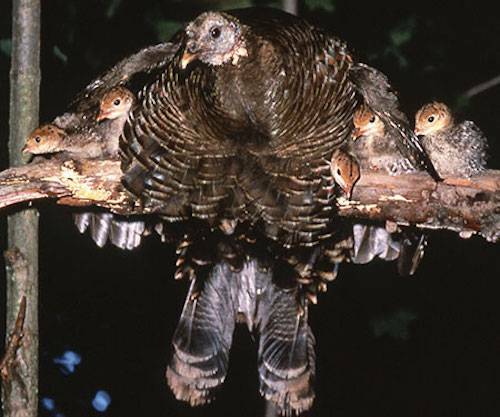 In nature, turkeys spend up to 5 months close to their mothers. Turkeys raised for food never know the comfort of the mother bird’s wings or the joy of exploring the woods and fields with her. 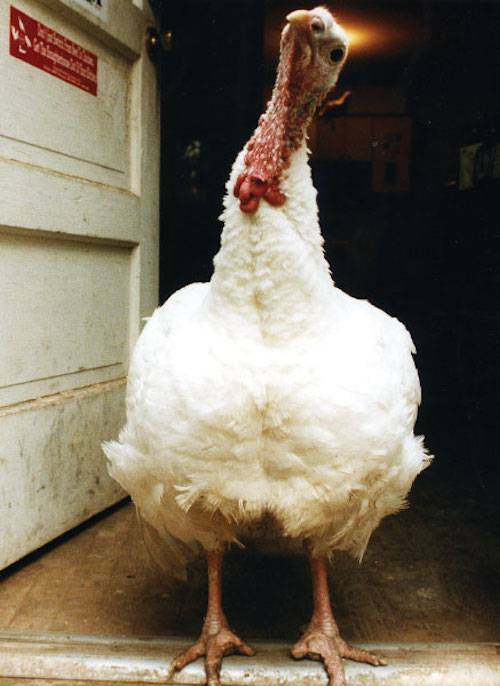 Turkeys are not suited to crowded confinement systems – including so-called free-range (a fraudulent term). When hundreds, even thousands of birds are forced to sit and stand in a crowded yard or in filthy litter (wood shavings and excrement) breathing burning ammonia fumes and lung-destroying dust, they develop respiratory diseases, ulcerated feet, blistered breasts, and ammonia-burned eyes. Most turkeys are fed antibiotics to promote artificial growth and to control Salmonella, Listeria, Campylobacter and other diseases transmittable to humans. Poultry Science reports that 72% to 100% of chickens, turkeys, and ducks have Campylobacter at the slaughterhouse – despite all the drugs. Forced to grow too large too fast, turkeys raised for food develop congestive heart and lung disease accompanied by engorged coronary blood vessels, distended fluid-filled heart sacs, abdominal fluid, and gelatin-covered enlarged congested livers. Turkeys are painfully debeaked and detoed without anesthetic to offset the destructive effects of overcrowding and lack of environmental stimulation. Beaks are amputated with a hot machine blade. 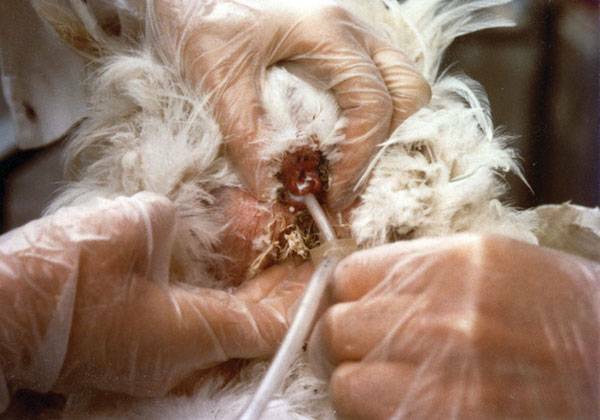 The blade cuts through the sensitive beak tissue causing severe pain and suffering in the mutilated birds. Debeaked birds cannot eat or preen properly, and detoed birds have trouble walking. Between 12 and 26 weeks old turkeys are grabbed by catchers and carried upside down by their legs to the transport truck. Jammed in crates they travel without food, water or weather protection to the slaughterhouse. 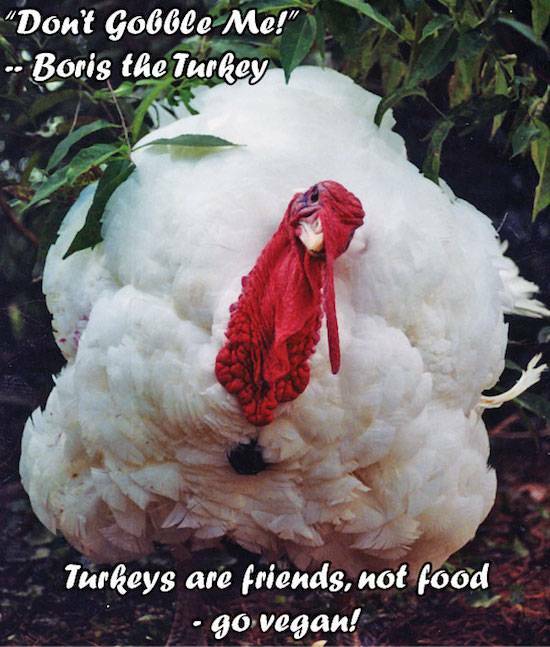 No U.S. welfare laws regulate the treatment of turkeys, chickens, ducks or other birds during catching, transport, or slaughter. At the slaughterhouse, turkeys are torn from the crates and hung by their feet upside down on a movable belt – torture for a heavy bird especially. They may or may not be “stunned” – paralyzed while fully conscious – by a handheld electrical stunner, or by having their faces dragged through an electrified waterbath. The purpose of electrical “stunning” is to paralyze the muscles of the feather follicles “allowing the feathers to come out easily” and has nothing to do with humane slaughter. The electricity shoots through the birds’ eyes, eardrums, and hearts causing “intolerable pain” according to researchers. Nor does throat-cutting, with or without prior electric “stunning,” produce a humane death. You Can Help Turkeys By Following These Simple Steps . . . Contact your legislators. Urge them to enact laws banning the crowding, debeaking, detoeing, drugging, and artificial insemination of turkeys. 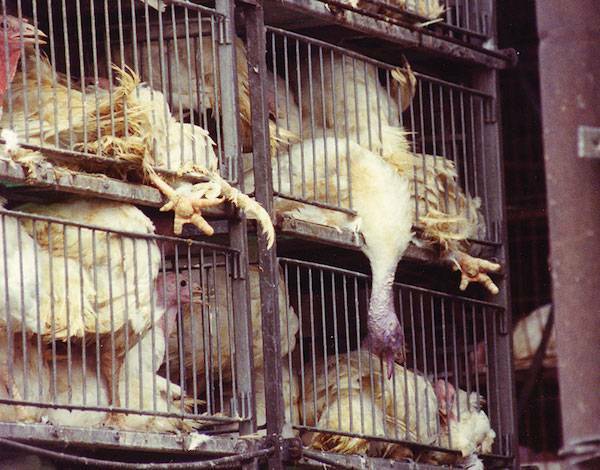 Urge them to adopt humane poultry slaughter legislation. To learn your federal Members of Congress call (202) 224-3121. Or find them at www.senate.gov or www.house.gov. Urge restaurants and stores to provide wholesome vegetarian foods free of meat, dairy and eggs. Support these restaurants and stores by purchasing their vegan products. Bypass “free range.” To learn more about the free-range fraud, visit www.upc-online.org/freerange . Urge restaurants and stores to provide wholesome foods free of meat, dairy and eggs. Support these restaurants and stores by purchasing their vegan products.